After a nice two day break that allowed some of the injured Thunder players to further collect their bearings, it’s back to the hardwood with one of those players back into the line-up. The Thunder start a home-heavy run that features 9 of their next 11 games in Oklahoma City. With the Thunder clinging to the 8th position by one game over New Orleans, this home-heavy schedule is exactly what the doctor ordered to combat the road heavy schedule that beat the team down in the beginning of the season. This is the second meeting of the season between these two teams. The Thunder won the first meeting 103-91. That was the first victory of the year where both Westbrook and Durant played, and it happened in early December. 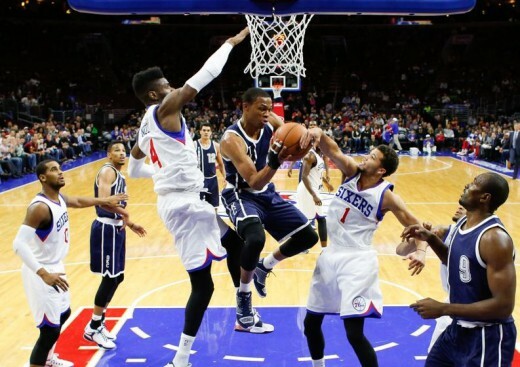 The 76ers currently find themselves with a 13-47 record. They score the least amount of points per game in the league (90.3) and give up over 10 points more (100.8 ppg). They have a roster full of 2nd rounders and undrafted free agents. They traded away last season’s rookie of the year, and the two players they drafted in the first round in the last draft have yet to play a game for them this year (Joel Embiid and Dario Saric). They are the epitome of tanking and the bane of the commissioner to field a completely competitive league. With all that said, the players themselves, play extremely hard. The Sixers are guided by 2nd year point guard Isaiah Canaan, who was acquired from the Houston Rockets at the trade deadline. In the 6 games he’s played for the Sixers, he’s averaged 10.5 points and 2.8 assists. The SG position has been a mix of JaKarr Sampson and the veteran Jason Richardson of late. On the other wing, veteran Luc Mbah a Moute is their veteran perimeter stopper. Up front, Nerlens Noel and Henry Sims are an inexperienced pairing, but can change a game with their different skill sets. Noel is a good rim protector and Sims is crafty offensive player in the post. The Sixers are literally like an elementary school team in that nearly everyone on the team plays. Their highest usage players off the bench are Ish Smith, Jerami Grant, Furkan Aldemir, Thomas Robinson, and Hollis Thompson. 1. Effort – Sometimes, its hard to remove the stigma of a team’s record from the players on the floor. But the Sixers are a competitive team. Maybe not as skilled as most teams in the league, but it is not due to lack of effort. If the Thunder don’t come out with the right mindset, the game could be a little bit more competitive than they had hoped for. 2. 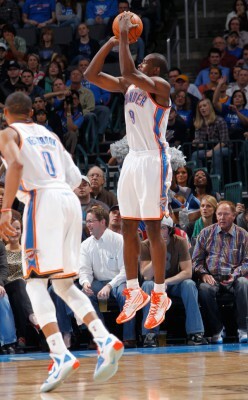 Serge Ibaka – His ability to play on the perimeter will help in pulling Noel away from the rim. Noel is a lot Ibaka in that his biggest asset defensively is as a rim protector. 3. Russell Westbrook – Welcome back after a brief one game absence. But, really, just a plain clear mask? Boooooo!!!!! !